Last week’s heart-breaking massacre of teenagers and others in Norway makes it dismayingly clear that the religious warfare at the heart of Al Qaeda’s crusade against the West and its supporters has now found its mirror-image not in the random act of a deranged lunatic, but in a meticulously planned execution of the anti-Islamic ideology that has been spreading like a poison throughout European political culture for at least a decade. In the name of preserving a Christian Europe, Anders Behring Breivik conducted an ideologically inspired terrorist attack against those he believed were Islamist terrorist sympathizers. In many ways, this latest act of religious hatred, carried out in the name of cultural purity, signals the febrile acceptance of Osama bin Laden’s invitation to reignite the medieval holy war between Islam and the Christian West. Breivik’s terrorist attack is only the most stomach-churning byproduct of a European-wide Islamophobia that has progressively taken on more frenzied overtones. A 2010 study conducted at the University of Exeter, and funded by the Al Jazeera Center, documented a dramatic rise in the number of hate crimes against Muslims in the East End of London and elsewhere in the UK. In 2006, the European Monitoring Center on Racism and Xenophobia documented an increasing number of attacks on Muslims throughout Europe—including 180 small attacks in France over a two-year period and sporadic attacks on Muslim mosques and businesses in Germany, Spain, Italy, and elsewhere, often by neo-Nazi or similarly vicious and racist groups. From Switzerland to Britain, the political pushback against Muslim populations has often occurred at a deceptively urbane level, particularly when it comes to matters of Muslim immigration, mosque-building, and integration. Norway’s Progress Party, to which Breivik belonged between 1999 and 2004, advocates a restrictive immigration policy that is largely acceptable in polite company. But non-violent Islamophobia is anything but house-broken, spewing of late increasingly virulent nationalist, anti-Muslim political rhetoric in Germany, France, Sweden, and elsewhere. Now that the simmering religious conflict in Europe has burst suddenly into public view in Norway, it is possible that Muslims extremists, skilled at fanning the flames of disenfranchisement and discrimination against immigrant communities, may use Breivik’s attack on the very idea of co-existence in Europe between Muslims and Christians as a pretext for carrying their holy war to a higher level. For Islamists, the preferred form of violent jihad remains the large scale attack—as we saw with the bombings in Madrid in 2005 and London in 2007. For right-wing opponents, prior to the bloodbath in Norway last week, the favored form of attack has been largely personal and small scale. 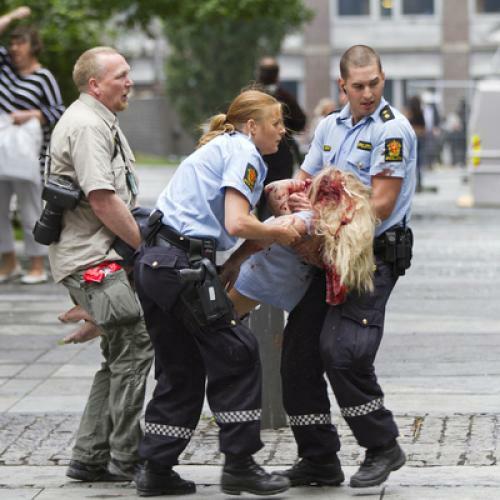 Both Islamists and Islamophobes like Breivik agree, however, that they are engaged in a clash of civilizations on the grounds of religious identity. Members of both groups are willing to commit violence in the name of holy war. They share a return to the medieval context that Osama bin Laden so actively embraced. Startling corroboration for this coincidence-of-opposites has now been provided by Breivik’s 1,500 page manifesto, “2083: A European Declaration of Independence.” Inspired vaguely by the Knights of Templar, it is as much a throwback to pre-modern times as bin Laden’s cave-dwelling opposition to modernity, integration, and tolerance. In Breivik, the Islamophobic radical right has revealed itself as the opposite side of an increasingly ugly coin. Karen J. Greenberg is the executive director of the Center on Law and Security at New York University. Karen J. Greenberg is Director of the Center on National Security at Fordham Law School. Her most recent book is Rogue Justice:The Making of the Security State.